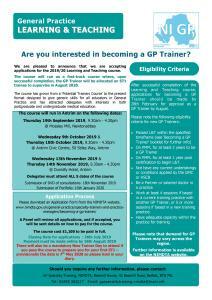 This course is designed to give an introduction to learning and teaching in General Practice. 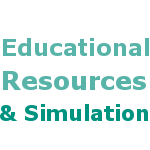 The course has grown from a ‘Potential Trainers Course’ to the present format designed to give generic skills for all educators in General Practice and has attracted delegates with interests in both postgraduate and undergraduate medical education. Applications are now being accepted for the Learning & Teaching course taking place in 2019/20. The course will run as a fast-track course where, upon successful completion, the GP Trainer will be allocated an ST1 trainee to supervise in August 2020. There will also be a mandatory New Trainer Day to attend if you pass the course to prepare you for your ST1 – provisionally the date is 7th May 2020 so please hold in your diary. Please contact gpspecialtytraining.nimdta@hscni.net if you have any queries. 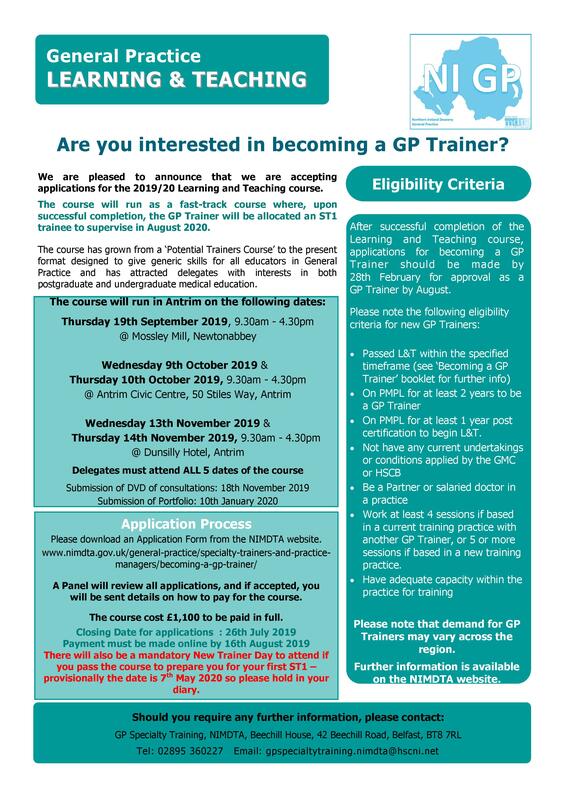 After successful completion of the Learning and Teaching course, applications should be made for approval as a GP Trainer by the next August. Please be advised that opportunities for GP Trainers may vary across the region depending on the need for new trainers in each locality. Have completed the Learning & Teaching Programme and passed the Portfolio assessment within a suitable timeframe. It is preferred that Trainer applications are made directly after completing Learning & Teaching as the approval process takes one year. In exceptional circumstances a Trainer may take up to 2 years, from the date beginning the L&T course to beginning supervision of a trainee. 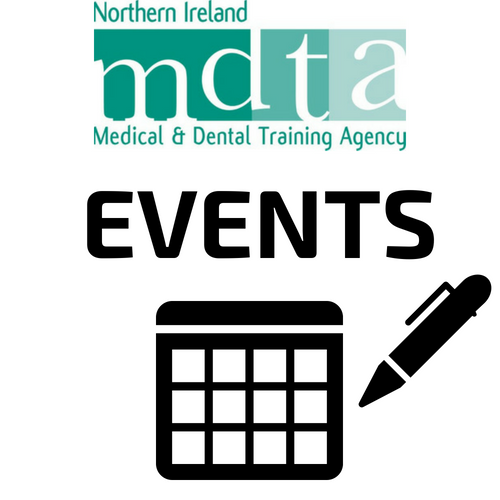 To do L&T – be on the Primary Medical Performer’s List in Northern Ireland for at least 1 year post certification. 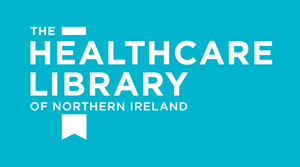 To become a trainer – be on the Primary Medical Performer’s List in Northern Ireland for at least 2 years post certification. Be a partner or salaried doctor in a practice. The clinical supervisor should have a permanent role with the practice (partner or salaried GP)For training practices with more than one trainer the trainers must work a minimum of 4 sessions and again a weekly timetable for supervision should be documented. Have adequate capacity within the practice for training. The premises must also be visited and approved for GP training. Please bear this in mind if the practice is planning a premises move. The standards for a GP Training practice are set out in the RCGP guidance document on Practice Training Standards – available on the NIMDTA website. How often does the Learning and Teaching course run? The Learning and Teaching course runs once a year, for 5 days, generally in September/October for Module 1 and February/March for Module 2. In 2016/17 a pilot one year accelerated course will be run with training taking place in September, October and November. Do I have to attend all 5 days of the course or can I miss any training days? You are required to attend all 5 days of the course. If you are unable to attend Day 1 of the Learning and Teaching course the Specialty Training Team will keep your name on the interested delegates list for the next available Learning and Teaching course. Most delegates will attend both modules of the L&T course in 1 year but in exceptional circumstances delegates could complete the course over 2 years. Please contact the Specialty Training Team for guidance. What happens if I decide not to proceed with the course? Can I get a refund of the course fees? The course is non-refundable however if you have attended less than 50% of the course, you can request a refund of 50% of the course fee. Alternatively you can defer your place to the following year and complete the course in year 2. Is the Learning and Teaching course still equivalent to one module of the MSc in General Practice at University of Ulster and/or one module of Certificate in Medical Education at QUB? No, the Learning and Teaching course is no longer equivalent to either of these modules.